All discus sold with padded case for protection and use for practice throw without having to retrieve discus. If you buy 3 or more discs, shipping is free! 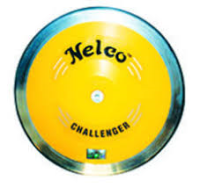 >>The Nelco Challenger Discus - is the perfect discus for beginner throwers looking for a high-quality implement at a great price. With a 73% rim weight and a RimGlide distance rating of 155 feet, this is a great discus for newer high school and college throwers as well as multi-event athletes. 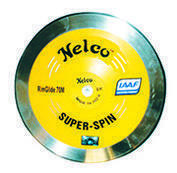 >>The Nelco Lo Spin Discus - is the best choice for a thrower looking for an implement they can use as a beginner and grow into as they improve their technique. The Lo Spin has a RimGlide distance rating of 65 meters making it perfect for most high school boys throwing between 140-170 feet. >>The Nelco Mid Spin Olympia Discus - was created for top level throwers looking for a discus that will fly far without an excessive amount of rim weight. The Mid Spin Olympia has a RimGlide distance rating of 67 meters making it perfect for high school boys throwing between 145-175 feet. 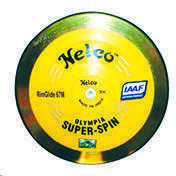 >>The Nelco Super Spin Stainless Steal Discus - was the Official Discus of the 2012 London Olympics, now in the 1.6kg boys high school weight! This discus was created for high level throwers who are reaching distances that routinely take them to the podium in big championship meets. The Super Spin Stainless has a RimGlide distance rating of 70 meters making it perfect for high school boys throwing between 165-200 feet who can apply loads of spin on the rim! >>The Nelco Gold Brass Rim Discus - was also the Official Discus of the 2012 London Olympics now available in the 1.6kg boys high school weight! This discus pushes the limit of how much rim weight a thrower actually needs to achieve peak distance! 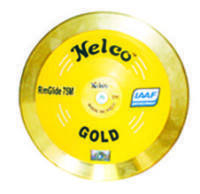 The Nelco Gold has a RimGlide distance rating of 75 meters making it perfect for the top 1-2% of high school boys in the United States throwing between 185-225 feet who can apply maximum amounts of spin on the rim and get a clean release on every throw. The brass rim is a softer metal than stainless steel making this a competition only discus for athletes who need the very best. 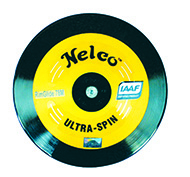 >>The Nelco Ultra Spin Discus - is for the thrower who has everything. This discus has the heaviest rim weight percentage I have EVER held in my hands! The Nelco Ultra Spin has a RimGlide distance rating of 80 meters making it perfect for high school boys looking to squeeze that last little bit of distance out of their top 10 nationally ranked throw. 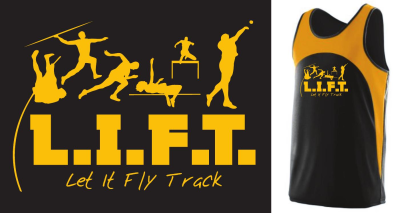 This discus truly was created for Gold Medal Winning, Elite Level throwers that plan on stepping on the platform during High School Nationals! 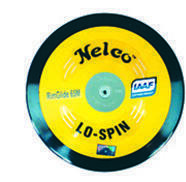 >>The Nelco Lo Spin 1.5K Discus is the best choice for a thrower looking for an implement they can use as a beginner and grow into as they improve their technique. The Lo Spin has a RimGlide distance rating of 65 meters making it perfect for any thrower who needs the 1.5kg size for their age group. 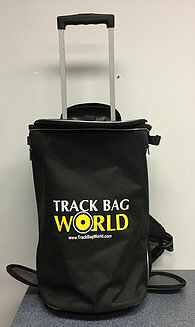 >>The BEST Discus Carry Bag on the Market! 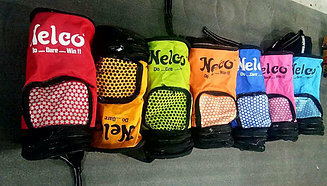 The Nelco 3 Discus Shoulder Carry Bag is absolutely awesome. Each bag contains three separate zipper pockets on the bottom to store each of your discuses. The front zipper pocket is a "dry-pocket" with an internal liner where you can store wet clothes, sweaty shirts, and your muddy shoes to keep them separate from whatever else you're carrying. The large zipper top opens up to a big storage area perfect for things like towels, athletic tape, a bag of chalk, or a few snacks to hold you over throughout the day. The shoulder strap is wide and padded making for a comfortable walk to the throwing circles. Finally, the bottom of each bag has rubber feet allowing the bag to stand vertical when discuses are loaded on the bottom. The rim weight of the discus is relative to comfort and skill level. Low rim weight discus doesn't necessarily go far and high rim weight discus are not guaranteed to go further. Finding a weight that is comfortable to the athlete and his skill level is the best chance in optimal distance. Low rim weight discus in theory are designed for beginners and as the weight goes up the logic is the discus will spin faster. Making it more aerodynamic and carrying with the ability to go further. However, if the athlete does not have the ability to spin the discus with enough force with the higher rim weight, it will result in a reduced distance because the discus will wobble and create drag and die. Many factors go into the distance of a good throw with any discus. Some factors are preference, skill level, and experience. 70-80-90% rim weight could be Novice - Intermediate - Advanced and the distances that come with that are relative to the throwers ability level. Another very important factor that plays into this, is the ability to throw a clean discus. Many advanced 200 foot throwers that can't hit a super clean release in their throw, so instead of using a 90% they use 80-85% to be able to throw farhter with their less than clean release. Any thrower that is seriously looking to get some good throws should start with an 80% and then move up from there as needed and able. There have been many 200 foot throws in training and competition with that rim weight. A thrower MUST be loyal to a discus. Don't get caught up with the technology of different discus and rim weights and end up throwing different discus' at meets. Take two different rim weight discus' to meets and not warm up with or touch anything else on competition day. Rim weight is a comfort and skill mechanism that does not increase the distance that you can throw but rather it increases the ability to maintain the aerodynamics and air foil longer through the duration of the throw with the ability to release with high force spin. Heavier rim weights increase radius and allow higher end throwers to apply forces. Too high of a rim weight may allow the discus to stop spinning throughout the throw if not thrown with enough force and spin. Without this high spin force, retention will be subject to the rim weight working against the throw diving prematurely. Any discus that stops spinning dies and is subject to dive. When throwing in Head Wind conditions move up in rim weight %. Take an easier throw focusing on hitting the wind and making a clean throw. The rim weight will help keep the nose down throughout the flight. 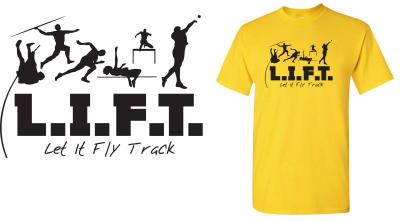 When throwing in Side Winds stay loyal to the discus you throw the most, for retention and more stability. When throing in a Tail Wind stay loyal to the discus you throw top distances the most consistently. This new design technology keeps the discus balanced over longer duration of throw, resulting in longer throws! For orders of any items please email me at [email protected] with what you want.